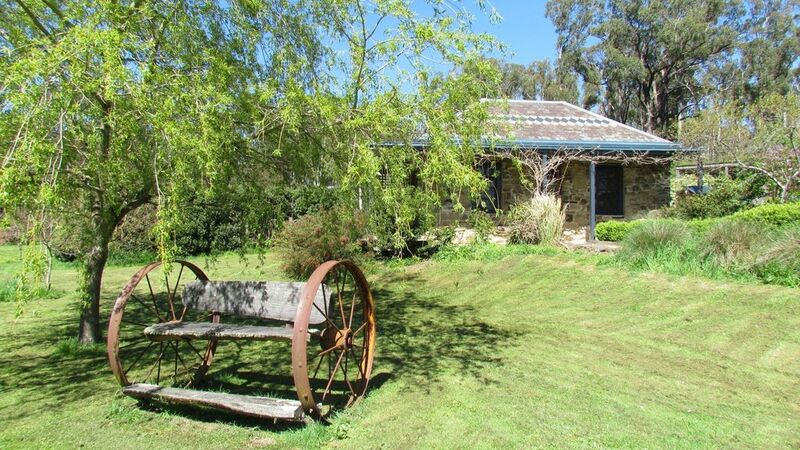 Two-time winner of Holidaying with Dogs' prestigious Five Paw Award, Hollow Log Estate offers a choice of two superb, self-contained cottages set on 23 acres overlooking the peaceful Wombat State Forest (also see listing for Hollow Log Cottage). The Stoney is a charming, studio-style cottage made of Castlemaine stone and slate. It sleeps up to two. Recommended in The Age, Best Weekends Away magazine, the Stoney is perfect for a romantic getaway, or an escape for people wanting to relax with their pets. Being a studio, the space is only suitable for one dog or two small dogs. The Stoney is surrounded by beautiful established gardens. Enjoy the abundant wildlife from your front verandah, magnificent sunsets over the forest, or take one of the many forest walks from your doorstep. The Stoney comes with all the trimmings for the perfect, relaxing break. A generous breakfast hamper is provided for your first morning and you'll receive a complimentary bottle of wine and chocolate. Hollow Log Estate is truly dog-friendly. Dogs are welcome across the property and inside the cottages. There's a fully fenced, half-acre dog play area, dams to swim in and a large outdoor dog bath with hot water. We appreciate that your dog is part of the family. Thank you for your kind review. I'm so pleased you enjoyed your weekend. We look forward to seeing you and your dogs again in the future. Thanks for taking the time to write a review. We're so pleased you and your dog enjoyed your visit. Small beautifully presented stone cottage with peaceful surrounds. Great for us and our dog. Very large fenced area for exercise and play for our dog. Friendly hosts. We have stayed twice and hope to come again. Fantastic! Lovely garden and setting. Friendly host. Private and peaceful. Ali, the owner was very friendly and met us after we arrived. Our two dogs enjoyed the dog play area and had a swim in the dam. Cottage was charming, clean and comfortable. Would definitely consider a return visit. Location was only minutes from Daylesford. Thanks for your review. We're so glad you enjoyed your stay. You'd be very welcome to come again in the future. We were welcomed by Alison and she looked after us very well. The property is beautiful and well managed and it was a delight to stay there. Our dog had a wonderful time and we would certainly consider returning. Everything was clean and the attention to detail was fantastic. A most delightful experience. Thanks for taking the time to write a review. I'm so glad you and your dog enjoyed the property. It would be lovely to see you again in the future. Thanks for your kind review. We're so glad you and your dogs enjoyed your stay.